My favourite way to enjoy cauliflower is raw. It’s a backlash from the over cooked, bitter and sulphurous smelling offerings of my childhood, but the recent trend of roasting cauliflower has won me over and I’ve surprised myself by enjoying cooked cauliflower. The first time I roasted cauliflower I coated it in miso for a Japanese accent, with this recipe I used Indian spices as my inspiration. As with my other roast vegetable salads, I simply tossed the florets in oil and dry spices then baked the veg in the oven until it began to caramelise. To say this was delicious is an understatement. 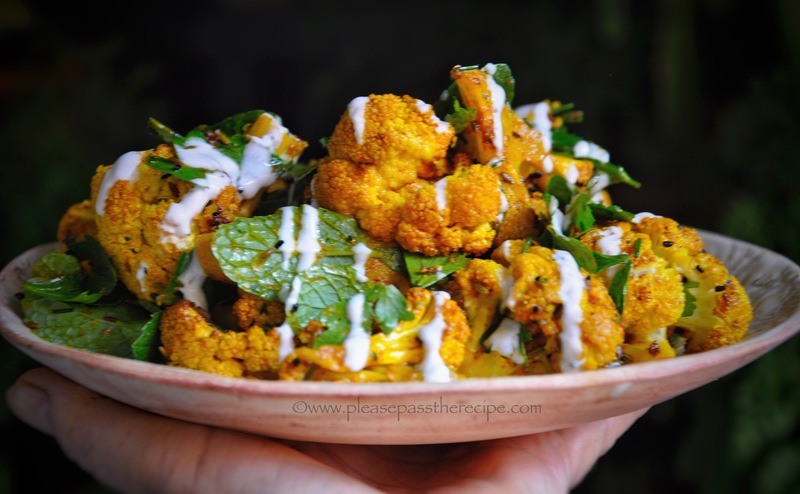 The spiced and roasted cauliflower would make a great starting point around which to plan a meat free meal or a great accompaniment to simply grilled lamb but either way be sure to serve the tangy yoghurt sauce to drizzle over. Preheat the oven to 180C and line an ovenproof tray with baking paper. Put the cauliflower florets in a bowl and drizzle over the oils. Mix together the ground spices, seeds and seasoning then sprinkle over the cauliflower. Tip the cauliflower onto the baking tray and spread into a single layer. Roast the cauliflower until it begins to caramelise, 20-30 minutes. Remove the cauliflower from the oven and allow to cool for 15-20 minutes. Toss through the fresh herbs. Serve warm or at room temperature drizzled with yoghurt sauce. Look like gobi Manchurian. It made with with cauliflower. We deep fried the marinated cauliflower and then used them to make roast curry. Sandra, I’m pinning this recipe and I agree it would be absolutely delicious with lamb. I’m sure we will, it sounds great. What a fantastic flavor combination. I must admit, our little Swedish pantry is void of Nigella seed. A new mission for this food blogging pensioner, find Nigella seed and make this dish. Thanks for the lovely inspiration. There can never be too many recipes for roasted cauliflower. The spice mixture sounds delicious. My kind of food Mrs R. Love the yoghurt sauce. This looks and sounds delicious! Lovely combination of flavours. How delish is roasted cauliflower! Like Kate and Fran I have never had an issue with the most beautiful looking cauli!! Have never used nigella seeds with such, tho’ in house. Must admit I do not have all these ‘infused’ oils in my humble pantry: we shall ‘make do’ 🙂 !! If I could use garlic cloves they would be my choice. Infused oil is a compromise for me. Nigella seeds add an amazing dimension.. Yes, yes and yes, ’cause I can for sure!! And have nigella . . . . have a good’one . . . .!! My husband once claimed that roasted cauliflower and broccoli are better than candy! He would definitely love this recipe. Great idea with the yogurt. You have converted a confirmed cauliflower hater to one that actually enjoys the veg now. I guess that sulphurous mush of my youth turned me off and then the British try (but don’t really succeed) to disguise it by laying on a cheese sauce. It was not exactly my veg of choice – until I started roasting and adding wonderful spices. This sounds like a great flavour combination. Thank you! I do love the flavour of curried cauliflower – I had a fortunate childhood which featured nicely cooked cauli rather than the soggy stuff so many others seem to have suffered from, so I’ve always loved it. And that bit of caramelisation is essential to the yummy flavour, isn’t it? For me, it’s sautéed in butter with garlic and a bit of cumin…. I also love roasted cauliflower and this recipe is a winner, especially with the lovely Indian seeds added and a hint of garlic in the yoghurt. Yum. This entry was posted on October 12, 2017 by ladyredspecs in Cooking, Food, Gluten Free, Light Savoury Dishes, Main Meals, recipes, Salad, Vegetarian and tagged cauliflower, Fodmap, gluten free, roasted cauliflower, roasted cauliflower salad, salad, spice cauliflower, vegetarian.